Individual income taxes are a major source of state government revenue, accounting for 35 percent of state tax collections. Their prominence in public policy considerations is further enhanced by the fact that individuals are directly responsible for paying their income taxes, in contrast to the indirect payment of sales and excise taxes. To many taxpayers, the personal income tax is practically synonymous with their own tax burdens. Forty-three states levy individual income taxes. Forty-one tax wage and salary income, while two states—New Hampshire and Tennessee—exclusively tax dividend and investment income. Seven states levy no income tax at all. Of those states taxing wages, eight have single-rate tax structures, with one rate applying to all taxable income. Conversely, thirty-three states levy graduated-rate income taxes, with the number of brackets varying widely by state. Two states—Kansas and Maine—impose two-rate income taxes. At the other end of the spectrum, three states have ten or more tax brackets, led by Hawaii with twelve. Top marginal rates range from Pennsylvania’s 3.07 percent to California’s 13.3 percent. 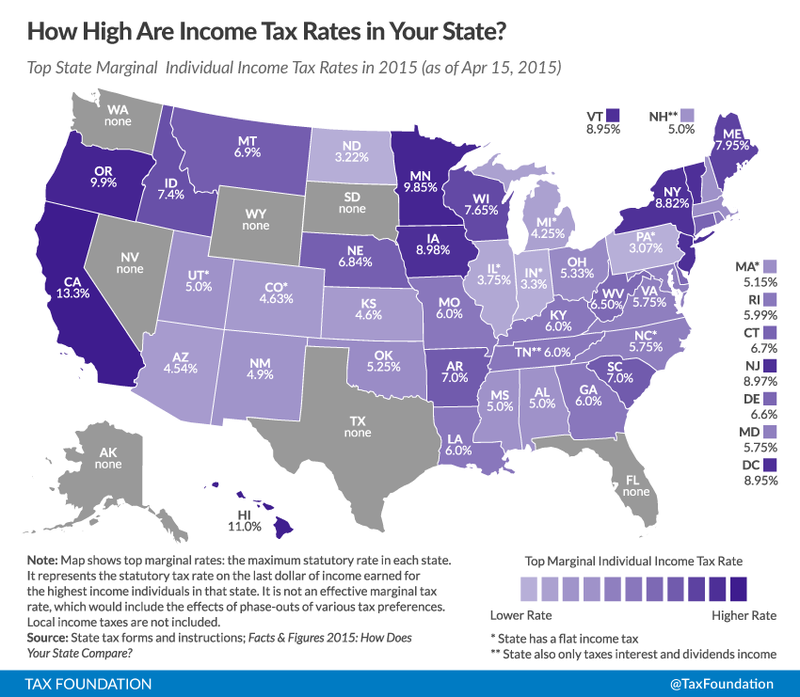 In some states, a large number of brackets are clustered within a narrow income band; Missouri taxpayers reach the state’s tenth and highest bracket at $9,001 in annual income. In other states, the top marginal rate kicks in at $500,000 (New Jersey) or even $1,000,000 (California, if one counts the state’s “millionaire’s tax” surcharge). States’ approaches to income taxes vary in other details as well. Some states double their single-bracket widths for married filers (avoiding the “marriage penalty”) and index tax brackets, exemptions, and deductions for inflation; many others do not. Some states tie their standard deductions and personal exemptions to the federal tax code, while others set their own or offer none at all. In the following table, we provide the most up-to-date data available on state individual income tax rates, brackets, standard deductions, and personal exemptions for both single and joint filers. the introduction of a new bracket in the District of Columbia which subjects income between $40,000 and $60,000 to a 7 percent rate rather than including it in the 8.5 percent bracket. Bob Secter & Rick Pearson, Illinois Income Tax Rate Falls 25 Percent, Chicago Tribune, Jan. 1, 2014, http://www.chicagotribune.com/news/local/breaking/ct-illinois-income-tax-rate-falls-met-20141230-story.html. Joseph Henchman, Indiana Approves Income Tax Reduction, Tax Foundation Tax Policy Blog, May 14, 2013, https://taxfoundation.org/blog/indiana-approves-income-tax-reduction. Joshua Miller, Mass. Tax Rate Takes Slight Dip, Boston Globe, Jan. 1, 2015, http://www.bostonglobe.com/metro/2014/12/31/income-tax-rate-fall-jan/0z4PxvHvtSxWOFja3EDZfO/story.html. Liz Malm, North Carolina House, Senate, and Governor Announce Tax Agreement, Tax Foundation Tax Policy Blog, Jul. 15, 2013, https://taxfoundation.org/blog/north-carolina-house-senate-and-governor-announce-tax-agreement. 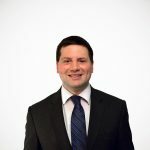 Joseph Henchman, D.C. Council to Vote on Tax Reform Package Today, , Tax Foundation Tax Policy Blog, June 24, 2014, https://taxfoundation.org/blog/dc-council-vote-tax-reform-package-today.